I can’t believe summer is almost officially over. What a seesaw of a season we had! Cooler than normal average temperatures, a few heat waves; nothing really stuck around long enough, and bloom time on some of the plants his year was really all over the place! Oh well, it has been a busy and hectic summer that seemed to almost get away from us from time to time, but the plants can always be expected to put on a show for all to see and we take great pride in showcasing some of the best for the Pacific Northwest. Our wave of volunteers has subsided a bit as the upcoming school year approaches, but a handful have expressed an interest in continuing and we couldn’t be more pleased with the efforts they’ve provided these past few months. 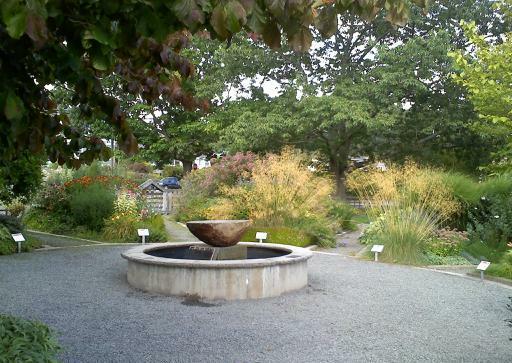 New interpretive signage has finally been created and installed in the Soest Garden! After endless revisions, tweaks and printing snafus, they are mounted and ready for your viewing and learning pleasure! These signs are sort of a test run to see how well they hold up and how well they communicate the information we hope to provide about the plantings here. So, if you have any questions and/or comments, we would like to hear from you! 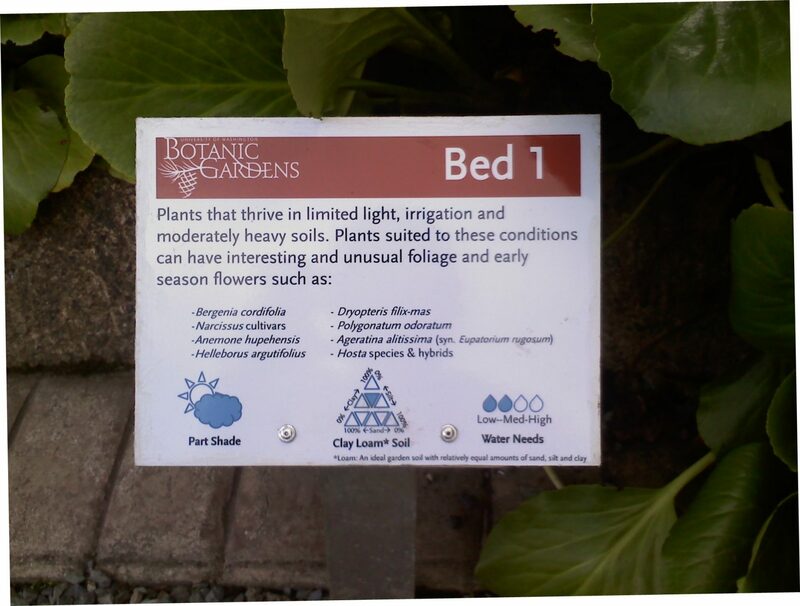 Each sign describes a bed\’s exposure, soil type, and amount of supplemental irrigation it receives along with just a few selections of plants suited to each condition. Early September is peak time for cherry picking at CUH! Cornelian cherries, that is! Cornus mas, to be exact is an attractive small landscape tree and our grove along Mary Gates Drive draws many people who often climb the trees, break branches and stomp on the groundcovers, while we appreciate people picking and using the fruit, we politely ask that they refrain from climbing the trees or the fence and from ripping off branches. I feel like it’s the one thing we truly do (outside, that is) that allows us to provide the community with something besides gardening information, a venue for events, or just pretty gardens to look at and admire. I would love to see us hold a fall festival where we would invite them to take part and perhaps have them share the wonderful things they do with the tart fruits they so covet! September is definitely the time to soak in the last rays of summer and see the gardens in their full splendor. I will try and take some more photographs and post them on Facebook, so if you haven’t joined the craze of social networking, it’s time to check it out! Or, just come and see us in the gardens! And speaking of volunteers … we could always use more help! See our Volunteer Page for a list of opportunities.